While snow is beautiful and winter’s trademark, it also makes for a colorless and bland world. This winter season, liven up your home with some indoor plants that thrive during the chilly season! African violets come in plenty of colors. The plant tends to bloom all year and does exceptionally well in an east-facing window, where the amount of sun is perfect! Plant your African violets in pots and set them on trays full of pebbles, as this will increase the humidity level to combat the dry winter air. Then, make sure to keep a good amount of water in the tray! Aloe is not only a great plant for its medicinal properties: it’s one of the easiest plants to grow! Aloe does well in small, sunny indoor areas and with a temperature around 70 degrees Fahrenheit. Keep the soil dry and avoid frequent watering to help your aloe plant thrive. Bromeliads add a very colorful touch to your home with their vibrant leaves. This plant does not need full sunlight and grows well in shadier areas, like a bathroom or a corner. It also doesn’t need very much water to grow, so only water it when the soil looks very dry. This plant naturally blooms in the winter and enjoys chilly temperatures, making it the perfect window plant. Cyclamen comes in a variety of different colors and, with good care, will last a very long time. Cyclamen likes indirect or filtered light and evenly moist soil. English ivy is an elegant plant, especially when the tendrils flow down from furniture or mantels. English ivy likes moist soil and cooler temperatures from the mid-50s to 70 degrees Fahrenheit. Ivy is also easy to gift! Cut a section of the stem and plant it in the same conditions as the original plant. Allow about two weeks for it to start growing again. The peace lily is a popular indoor plant due to its easy-to-care-for nature and beautiful blooms. It also improves air quality! The peace lily enjoys lower levels of light and standard temperatures. Keep the soil moist but refrain from too much watering! This plant has an air-purifying effect and helps remove toxins from the home, such as formaldehyde, making it a great plant to own. Pothos has trailing stems and would do well in a hanging basket or on an indoor trellis. Cut back the stems when they get too long to keep your plant full and healthy. Pothos does well in a variety of lighting levels, but avoid too little light as this will affect the leaves’ variegation. Soil should dry a bit between waterings. With leaves that look like shamrocks and small, white flowers, it’s easy to see why this is a popular winter plant! The shamrock plant enjoys bright spaces but refrain from placing it in direct light. Allow the soil to dry a bit between waterings. Plants are a wonderful addition to any home and can help combat the winter blues. Most winter plants are relatively easy to care for and grow. They don’t require much tending, making them perfect during the busy holiday months! Are you looking for outdoor options that suit the wintry weather? 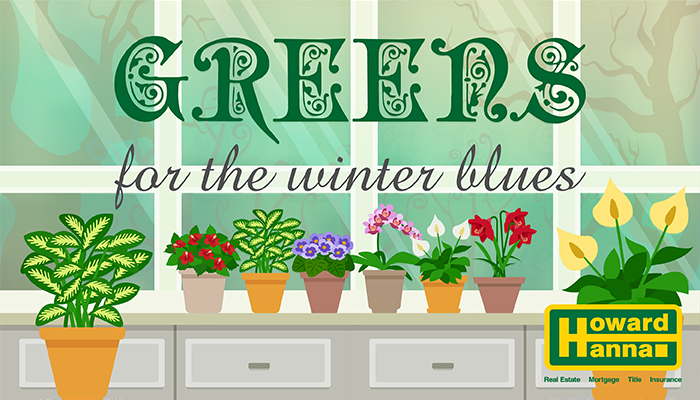 Check out our new blog, Greens for Winter Blues: Part 2! Or, think forward to your spring and summer garden now with these tips for planning a garden.